It is fair to say that kitchens are the heart of the house. If you think about it, nutrition is one of our most basic needs. 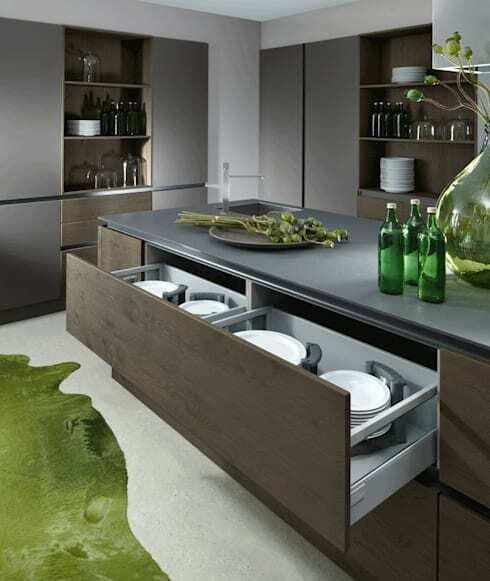 Kitchen spaces play a huge role in nourishment, from the devices to the storage spaces. Throughout history, these spaces have been used to store and cook food, however kitchens have evolved into true contemporary culinary areas. They play an active role in the social and engaging elements of home. This evolution has seen them go from small little areas to large, expansive and interactive areas. This historical transformation that has been influential in shaping the actual space of the kitchen has also seen a parallel development in kitchen technology. Nowadays it is standard for all kitchens to feature exceptional accessories. These allow us to be far more efficient in day to day cooking and food preparation. This is why today on homify, we are going to look at a range of kitchen accessories which can make life that much easier. Special storage units are often used for cutlery, spoons and knives but these aren't always accessories made from a variety of materials such as wood, plastic or metal. They were also formerly bought independently from cabinets. Now we can choose these accessories according to the size of our drawers as well as our preference of materials. 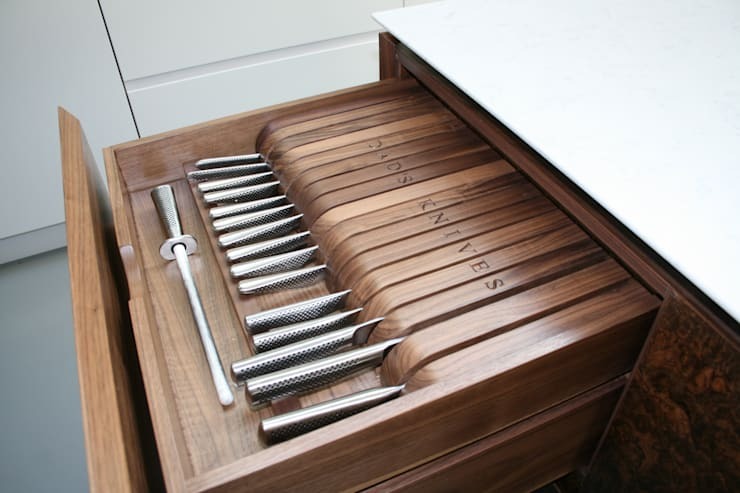 If you have a wide drawer, for example, you can organize your cutlery storage depending on the space available. This is a practical way to make the most of your drawer space. Quality, sharp knives are indispensable to a good cook. This is why those who really have a passion for cooking choose their knives carefully and invest in high quality pieces. With a good knife, you can cut more comfortably, smoothly and quickly. So where do you store these knives? Some knives are put in their own special boxes or are used as stylish accessories, especially if they are made with designer blades. 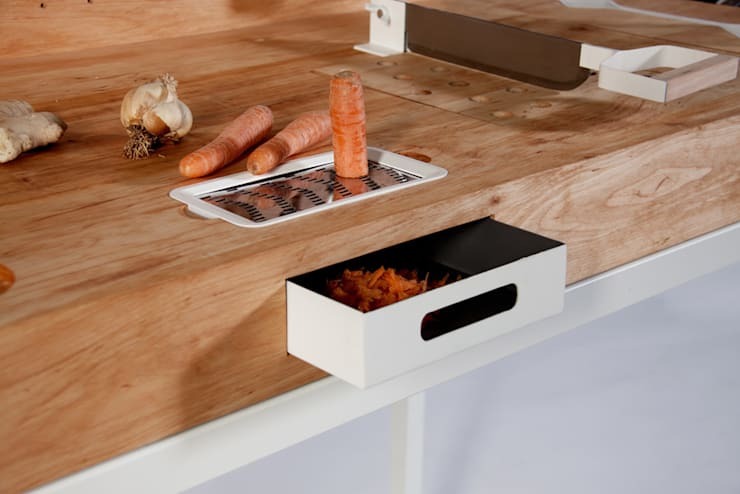 As we can see in this image, by design professionals Place Design Kitchens and Interiors, you can also really have some fun with the coverings for knives. Add letters, initials or fun words for a touch of personality. 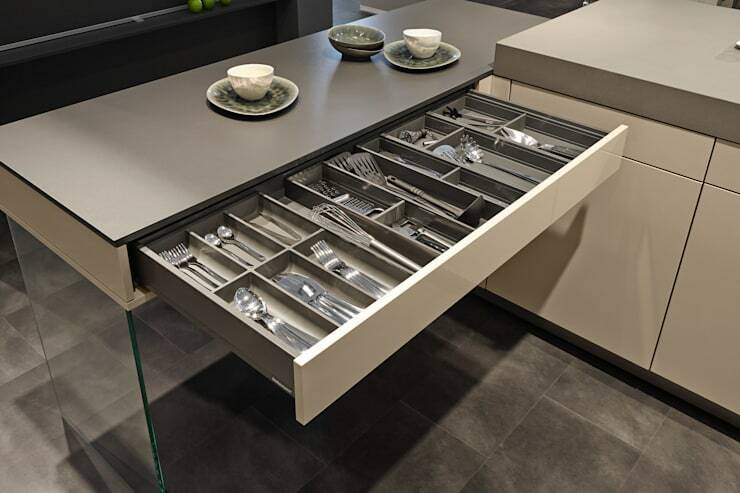 Thanks to technological improvements that allow drawers in the kitchen to carry a heavier load, we can use drawers as well as cupboards for plates. 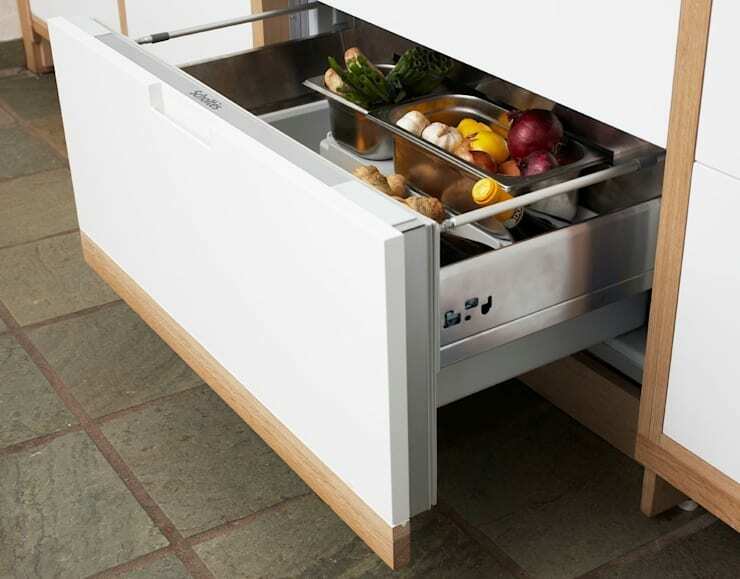 There are also so many kitchen cabinet accessories that allow plates to be stored securely in these drawers. You can insert cylindrical snakes into the drawer, keeping the plates stable, for example. This is elegant and functional! 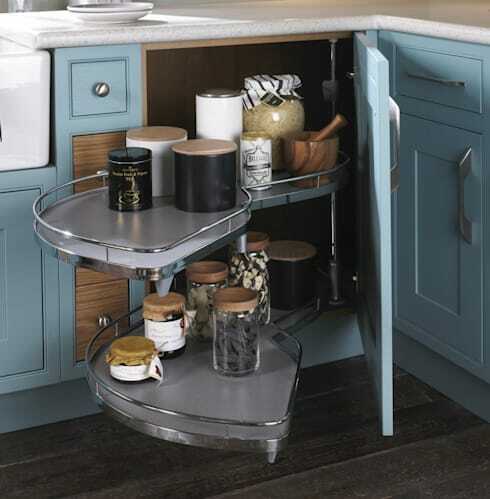 Also have a look at these 8 clever ways to improve storage in your kitchen. This very original design is inspired by the butcher's bench. When using the grater attached to niche in the counter top, a drawer below it catches the shredded material easily and conveniently. This very special design may not be useful for everyone but it is a very interesting and practical accessory for cooking enthusiasts. It makes for a very modern and savvy kitchen counter too! An unusual design awaits us in this drawer. The toaster can be inserted horizontally when the drawer is closed. When the drawer is open, the toaster can be turned ninety degrees. It thus pops out and can be used. This is a great solution if you don't want to keep your toaster on the counter. The electrical connection fits inside the drawer. 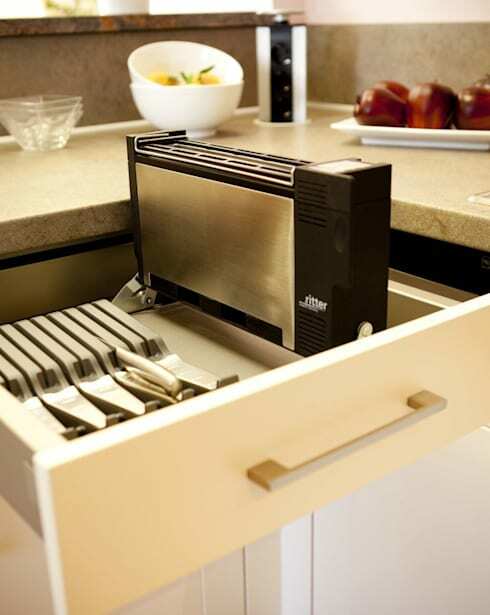 What's great about this is that you also have quick and easy access to knives in the drawers with this solution. Every inch of space has been utilized. For those who prefer a minimalist kitchen, this is the way to go! Modern technology has also seen the evolution of those pesky corner cabinets. The main problem with corner cabinets, as many of us know, is how difficult it is to reach inside them! In this image, we can see how a rotatable system has been installed, allowing the whole cabinet to be pulled out for easy access. This is very practical and stylish! Often we end up storing all sorts of items in the deep drawers in our kitchen, which leads to very messy and chaotic spaces. So why not install containers, levels and layers inside of drawers? Use containers to keep you fruit and vegetables in these spaces and remember that they can carry quite a lot of weight! Thus they are great for things like potatoes or onions. This will keep your counter and refrigerator clean! 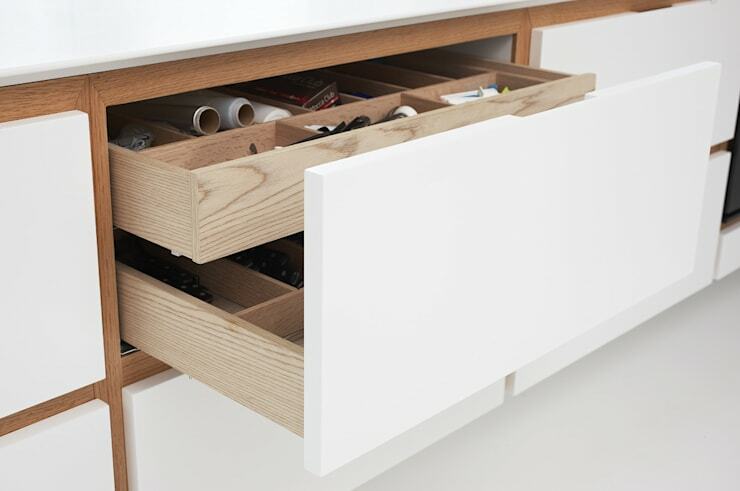 Deep drawers can also be used for a range of different accessories. What's more is that you can place a second drawer in a deep drawer. This allows you to store more items without compromising on accessibility or the ability to see what is in these drawers. The inner drawer can also neatly organize materials according to their usage. Sometimes the size of the kitchen means that you can either use narrow cupboards like this one or you need to find an alternative solution. Yet narrow cupboards can be incredibly convenient, especially if you can pull them out and open them up like the designers have done here. Maximize the depth of the space if you can't maximize the width. If you've enjoyed exploring these kitchen accessories, you'll love this article: 6 smart kitchen storage solutions. Which accessories would you want for your kitchen?